Standing nervously at a pitch black deserted but somehow rammed Sub-Saharan bus station at 4.30 in the morning clutching a scrap of paper, I ask myself why have I decided to put myself through this, especially as this will be my only independent holiday of the year. And at this moment in time, I cannot answer that question positively. The scrap of paper I am holding is my bus ticket to Kigali, on which is written Benaco, a city which I think it is on the border between Rwanda and Tanzania, but to be honest I am not really sure where it is. I am hoping that the bus which I am ushered onto is going towards the Rwandan border and that I will end up at some point later today in Kigali. My bus is due to leave Mwanza bus station at 5.30am and I have planned to meet my friend in the Rwandan capital at 6ish tonight. Admittedly I could have flown… but I am not a huge fan on flying. It’s not that I’m scared of flying, I just find it very boring. My problem with flying lies with the fact that the experience is devoid of wanderlust – when you fly you have a homogeneous experience, the same as everywhere else in the world, the same food, the same uniforms, airports are even the same colour and use the same architecture, and for me, it feels like being trapped in a lift for a few hours, with access to a stash of complimentary nuts. So in answer to the question, why am I putting myself through this, is to have an adventure, to have a real feeling of wanderlust and to see the landscape and the share a journey with people of the country which I am currently calling home. 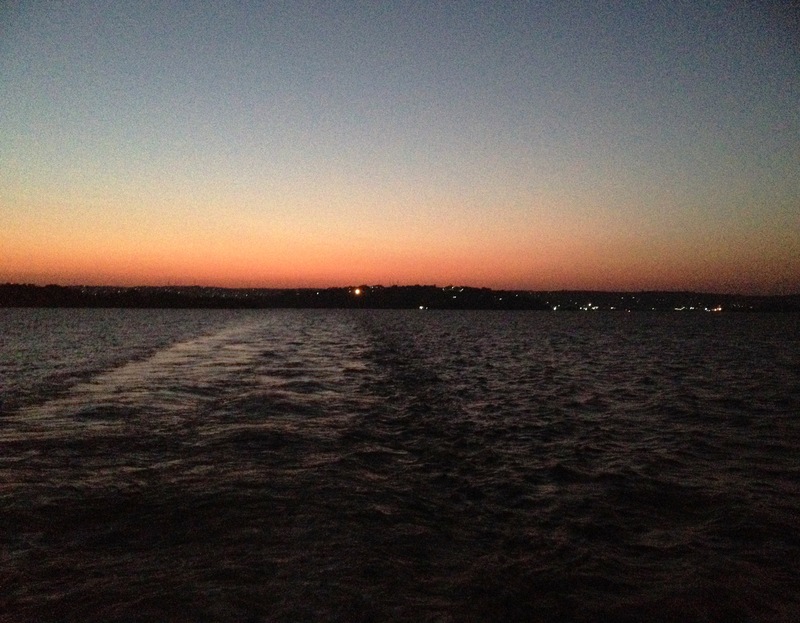 Sunrise on the ferry crossing Lake Victoria. The experience does not let me down. The bus ride starts with a journey into Mwanza city centre, where we are put onto a ferry, and see the sun rise over Lake Victoria. What follows is not what I expected. I was hoping for a ride where I would be able to read my books, look out the window, catch up on a few podcasts and enjoy a bit of peace and quiet away from my wonderful, but demanding, three young children. The seat I chose when I booked my ticket was at the front of the bus, but there has been some confusion as to validity of my ticket, so I have now ended up in K2… at the back of the bus, where you feel every little bump and dip in the road – and by jingo are the roads bumpy. They are so bumpy that I can not read, to be honest, I can not even hold my book, much to the amusement of my fellow Tanzanian travels, who are laughing at me, as I try to hold on with one hand and my book keeps flying out of my hand, similarly my head phones won’t even stay in my ears. For the next few hours there are times when it feels like we are experiencing of turbulence. At times, I can barely hold on to the seat, I am gripping on with both hands and it really is a bit of a white knuckle ride. I am sharing my seat with a family, mum, dad and twin boys and for most of the journey one of the boys is sat on my lap. By now everyone on the bus (and when I say everyone, I mean everyone… and the bus is packed to the gills) knows I am going to Benaco, and every time I meet anyone’s eyes, they smile, laugh and say Benaco… At first I smile and laugh back, for about three hours, but then paranoia gets the better of me and I wonder if they are all laughing at me and that the bus is really going to Nairobi. We reach Benaco eight hours later, practically all the passengers on the bus start to yell simultaneously at me and the driver, “Hey Mzungo – Benaco!”, (Mzungo is a bit of a loaded word in Swahili, but in general it is the Swahili word for a white person or non-African person) but it is taking me a while to get down the aisle, packed with people and luggage. Everyone waves as I leave the bus, and I wave back. I am bundled into a car, with about five other people and taken to the Tanzanian border. Here we are met by many taxi-drivers and money changers, I change money, get my passport stamped, and am bundled into another car, a taxi this time, and driven across the impressive Rusumo Falls border crossing, go through an Ebola checkpoint, get my passport stamped on the Rwandan side and get into a mini-bus heading for Kigali. On the Rwandan side, the buses are more swish, there is even some music, the roads are not bumpy and I am finally able to read some of my book. But the scenery is breathtaking and I cant take my eyes off the beautiful landscape. I now see why Rwanda is called the land of a thousand hills. As the sun sets over the endless plantations of banana groves I realise my mobile phone has run out of charge and there is no way I will reach Kigali Nyabugogo bus station in time to meet my friend. I arrive in Kigali at about 7pm – and seem to have come full circle – for here I am once more, standing nervously alone in the dark at a rammed Sub Saharan city bus station, clutching a scrap of paper. The piece of paper has my friend’s number and the hotel where she is staying written on it. I think prudently and ask at one of the bus station offices if I can use their phone to call – they do. I get through to my friend, who has wisely gone to back to the hotel, rather than waiting around in the dark. I take a cab there and within a hour we are celebrating friendship, travel and past and future adventures, over a few drinks in a local restaurant. Brilliant narrative and paints a perfect picture of your ‘adventure’ ! Confusion, in Africa, surely not !! Well done for even attempting it, but the reasons are so valid. Enjoy the time with your friend. Wow. That bus ride sounded like such an amazing adventure. I would kill to see the sunset over lake victoria!! Kudos to you for doing this on your onlyholifay!! Thanks. I have actually been living in East Africa for three years now, for two years in Tanzania, first in Mwanza on the banks of Lake Victoria, then on the coast of the Indian Ocean in Dar Es Salaam and now we have just moved to Nairobi in Kenya. Lots more adventures hopefully to come! That sounds like quite an adventure! Also interesting to read that you prefer the bus over flying. Thanks for sharing your story here! What a great adventure. And I love the first picture. although the sun rise is nice too. Same here. If I only have the time, I will definitely take the bus or train rides just to see the countryside. No matter how long it will take but the experience is totally worth it. So yes I will definitely trade the plane ride over the bumpy bus ride just to have an adventure and see that glorious sunset. It really look so much more interesting than taking a flight. I hope you enjoyed your vacation and had a good return journey. Wow! To be honest I read your post with almost one breath. Such an experience, I bet it is something to remember for the rest of your life. I really enjoyed reading about your journey, great story! A lovely read, and I love your writing style! crowded buses are for seasoned travelers. I had a similar experience in Morocco on about a 7-8 hour busride down to Marrakesh. It was rough. Adventures come in all forms. Traveling with our soul sisters is the best. Enjoy it all.